From the publisher: "Athlete. Runner. Marathoner. Are these words you wouldn't exactly use to describe yourself? Do you consider yourself too old or too out of shape to run a marathon? But somewhere deep inside have you always admired the people who could reach down and come up with the mental and physical strength to complete such a daunting and rewarding accomplishment? You can be a marathoner. 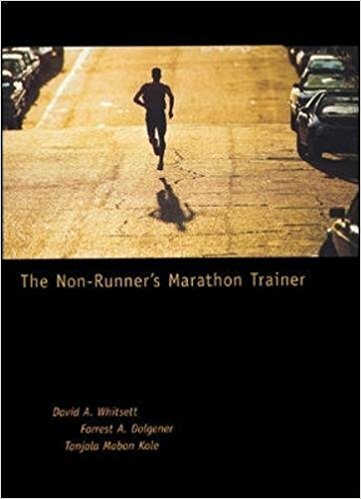 The Non-Runner's Marathon Trainer is based on the highly successful marathon class offered by the University of Northern Iowa, which was featured in a Runner's World article titled "Marathoning 101." The class has been offered five times over 10 years, and all but one student finished the marathon. That is approximately 200 students -- all first time marathoners and many with absolutely no running background. This book follows the same 16-week, four-day-a-week workout plan. You don't have to love to run -- you don't even have to like it -- but you have to realize that you are capable of more than you have ever thought possible."